Eheh, I hope so! It will be my first GAW here, so I just hope it goes well! That is what I am hoping….. ….. but time will tell. Like you said earlier… better done right than rush it. Add me in for one please. A third FW3A prototype hit Germany, no full reports so far. I’m already in for 2 units (#558, #559), I would like 2 units more = 4 units in total. TIA. I’m in for one if not too late! Let the absence be absent and the FW3A say “present”! 4700 threads into this … lol. Missed nothing!! So/ can someone please point me to a “latest” spec/photo/ Etc thread number to more quickly come up to speed of the current state? Yes I read the intro thread and saw the updates .. love the ramp mode BTW.. ALL lights should have a ramp feature plus the .3 Lm moon mode! Absence also makes the heart go yonder. 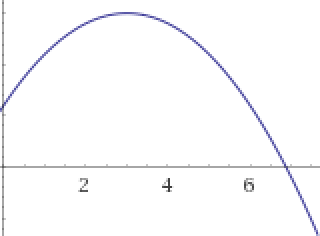 Really, it’s kind of a curve, similar to “15 - ((x-3) ** 2)“. At first it makes the heart grow fonder, but after a while it turns around and goes yonder. Yes, I just plotted human emotion on a graph. Pbtbtbt. The SST-20-W (both 3000K and 4000K) is indeed a very very good new option for the FW3A, it has an extreme nice performance in a triple Carclo (these leds are in my current EDC, a Jaxman E2L shorty). If the project lingers on a bit longer in its usual speed , Lumintop may have time enough to get hold of these leds? The NFD25 is flat, designed to spread out the beam. So, not the right category of product. The NDF25 is a cone, and it technically fits, but it’s not a good fit and not very useful as a diffuser cone either. It’s basically transparent, doesn’t emit light very evenly, and does weird things to the tint. There’s also a stretchy silicone one, but it’s difficult to put on, it isn’t opaque enough, and it looks awkwardly like a stubby condom. So I’m still looking for a diffuser cone which fits well and is opaque. I like it’s collapsible and I use it only on low. I really like the concept and think it will be very useful, bought one. Please add me to the list for 1.Thanks. I just bought a handful of these from KD this week. I’m excited to get them into a few builds. About to pull the trigger on D4S to hold me over until this is finally available. I did already order an Amutorch SS 1xAA that’s going to to receive an sst20w and some blueing from a propane torch.. but that may take a while to get here. On a related note, I have LH351D 5000K 80CRI emitters in my FW3A at the moment, with a 10507 optic. These are not the ones to be used in production, but they’re the closest I could get easily. So the tint is all wrong, but the beam pattern should still be pretty similar. This shot is underexposed on purpose to show beam pattern and tint. The camera’s white balance is set to “daylight” (5000K). And the lights are at low levels, which makes the tint look as bad as possible. It doesn’t look anywhere near this bad in real life. On the left is a ROT66-219b at ~4700K. On the right is a FW3A with LH351D 5000K 80CRI, apparently from a rather green tint bin. The emitters used in production should be 1000K warmer, with higher CRI, and not green. The 10507 optic gives the LH351D a big wide hotspot with a defined edge and virtually no spill. With a 10511 optic, the beam is floodier and smoother with no noticeable color variation and no edges. 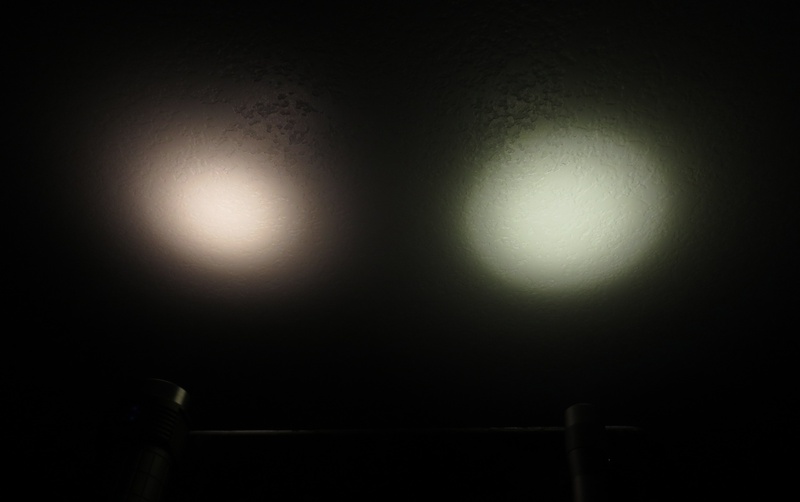 Actually the LH351D 4000k 90CRI from both group buys are very yellowish when compared with Cree 5D or 5A tint. When compared with the ROT66, they look green, same as in your comparison. The tint bin for both GB are T6 and T7, which is supposed to be on or below the BBL but actual testing show they are above. Some folks applied a minus green filter on their flashlights and reported very good resulting tint. Do you have any idea what tint bin Lumintop bought? 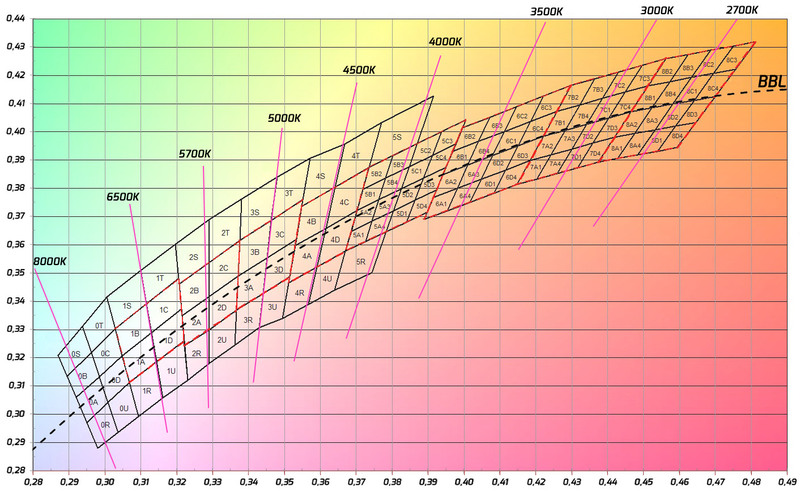 Also for next revision, I hope they consider Luminus SST-20-w 95CRI. The one sold on Kaidomain is the FB4 tint bin, which is above the BBL so is kind of yellowish like the LH351D and and 219C but Djozz tested it with a reflector and it got pretty close to the BBL. However, Fireflies was able to get the SST-20-w 95CRI 4000k in the FA3 tint bin, which is at or below the BBL and should look much better. I think this will be a much better option than the yellowish LH351D unless the reel Lumintop gets is better than the ones sold in the groupbuys. I do wonder what actually happened with the LH351D IMO. The first batch from AEDe was under the BBL, and absolute pure white, less green than the current one, and less red than the 219B, making it pretty much perfect. The second batch was still under the BBL, but looks more green. Perhaps the reason for this is that we all keep comparing it to the 219B, which is known to be extremely rosy. From what I remembered, the first batch was not under the BBL. It is about the same as the 219C, which is yellowish. Mauka tested it in his Wuben TO46R and had to use minus green sheets to get it just below the BBL but output loss was I think about 17% to 20%. This is a great chance due to the slow pace of this project. Would be perfect for this light. I would love to buy one! Please put me on the list. That’s pretty funny. I think in this situation it’s better to call it a graph of one’s patience. My fondness for one of these lights has not really changed much. Please add a 3rd one for me. #1500, 1501. Thanks! Count me in for 1 please. Thanks! Please add me for 1. Thanks! Is this project still alive? I haven’t seen anything in a couple of months. Yes, alive, and seemingly close to fruition.